This 3-day class led by Kenneth Magnuson will help you advance your Rosemaling skills. 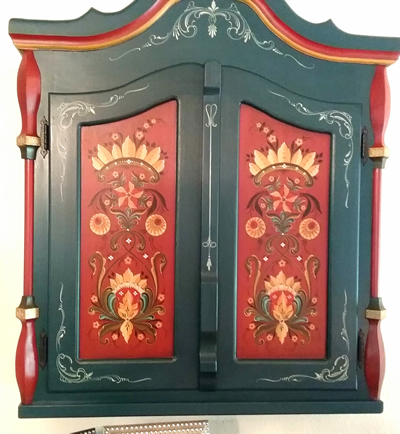 Magnuson is a recipient of the Vesterheim Gold Medal, which honors excellence in Norwegian-style rosemaling. His class meets Fri.-Sun., Apr. 26-28, 9am-4pm, at the Zumbrota Public Library. This advanced class will feature the Halingdal style. Bring your own final project piece that is background finished and ready to go so that you can concentrate on designing the artwork. The first couple of hours students will "brush up" on stroke work, handling and caring for brushes and a little time on wood prep. We'll spend our class time working on 6 different holiday ornaments. (Ornaments will be available for purchase, $2/each, at class.) Pictures and patterns will be available. For practice work, Ken recommends students bring heavy paper or cardboard (breakfast food boxes work well) that has been backgrounded. Ken believes you will get more out of the class this way, as you can write comments on it and use it for future reference. You may also choose to start a project to be completed at home, such as a plate or other object, that you've brought with you. Click on the link (at left) for a list of supplies. Reservations are taken on a first come first serve basis. Many of our classes fill up early - so don't wait too long! We take phone reservations with a valid credit card.